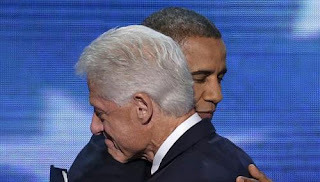 CHARLOTTE, North Carolina, (AFP) - Bill Clinton told Americans on Wednesday that he believed "with all my heart" that President Barack Obama saved the economy, had left them better off than four years ago and should be re-elected. The two-term Democratic president, who remains highly popular nearly 12 years after leaving office, delivered a comprehensive, unequivocal and glowing endorsement of Obama's presidency and hammered rival Republicans. "No president, no president - not me or any of my predecessors, no one could have fully repaired all the damage he found in just four years," said Mr Clinton, in a prime-time speech at the Democratic National Convention. "He has laid the foundations for a new modern successful economy of shared prosperity and if you ever need the president's contract: You will feel it. You will feel it folks," said Mr Clinton, apparently fighting a sore throat.